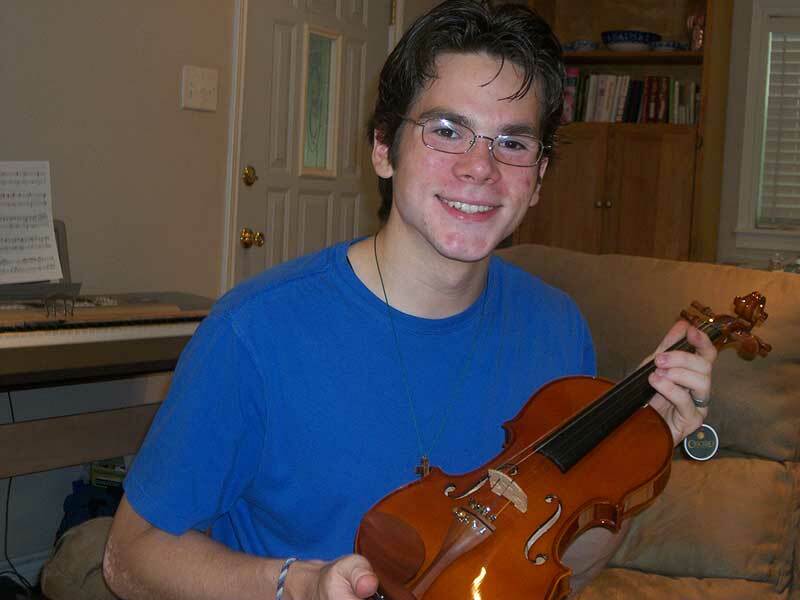 Congratulations to gStretch for winning the Fiddlerman's third free giva-away violin | LEARN TO PLAY THE VIOLIN FOR FREE! gStretch from Fiddlerman’s forum is the lucky winner of the CVN-200. Here is an e-mail from “gStretch” after winning the violin. My name is Ramon Gerardo Lopez, Jr., but I’ve been called Gerry forever. I am 17 years old and have lived in East Texas all my life. I’ve been homeschooled since kindergarden and will hopefully graduate 2012. My dad exposed me to classical music at an early age by public radio and cd’s. I remember going over to his keyboard and clicking the demo button that played the William Tell Overture. I started out playing piano at about 8 or 9 years old and have been playing pretty much ever since, minus a year or so. I enjoy playing music, especially classical. Music means alot to me, it has been an outlet for many emotions over the years. My faith has also played a part in my music, such as what i listen to and what I play. Since I’ve been taking piano lessons and have learned so much, I think I should use music some how in my life, and I am considering how to do that, perhaps something along the lines of what Fiddlerman does with free music lessons. In my search for other instruments to learn, I found fiddlerman’s youtube videos and eventually the forum. I am very grateful for winning the CVN 200 and I look forward to learning the violin with the Fiddlerman family. Congratulations on winning the free CVN-200 violin drawing on Fiddlerman TV today. The exciting thing about gStretch winning is that he has been super enthusiastic about learning to play the violin since day one and has never had the fortune to be able to get one. I went back and checked some of gStretch’s posts and came to realize that he has an extra strong will to learn and I am happy that he will finally be able to start his new journey. We forum members feel as though we have gotten to know gStretch quite well from all his posts and all of them made with a sincere desire and yearning to learn. I will be sending the violin to gStretch on Monday and updating this post soon with more information on gStretch and hopefully a picture when he receives it.